MOUNTAIN VIEW, CA – October 19, 2010 – Today eHealthInsurance (NASDAQ: EHTH), the leading online source of health insurance for individuals and families, released answers to frequently asked consumer questions (FAQs) about provisions of health reform that expand access to health insurance for children. 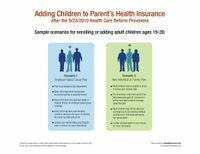 By expanding coverage for dependent children – Children under the age of 19 can no longer be excluded from group or individual health insurance coverage due to pre-existing medical conditions. By extending coverage for adult children – Adult children are allowed to retain health insurance coverage under their parents’ plans until they turn 26. Question: I tried to apply for family coverage in the non-group market in the past but didn’t enroll because the insurance company wouldn’t cover my 12-year-old daughter who has a serious medical condition. Should I try again? Answer: Yes. Though adults age 19 and over will still be subject to medical underwriting and may be declined for individual and family coverage based on their medical histories, your child can no longer be declined for coverage based on a pre-existing condition. 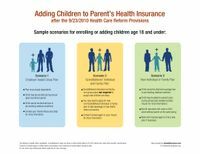 Depending on the individual and family health insurance products available in your area, you may be able to apply for a plan that covers both of you or one that covers your child alone. Some health insurance companies are establishing a defined open enrollment period for enrolling children in individual or family plans, so check with your insurance carrier or state insurance commission for more details. Question: I already have my own individual health insurance plan and want to add my seven year old son with a pre-existing condition. Can I do that now? Answer: It depends. The requirement that insurers cannot deny coverage to children under the age of 19 based on a preexisting medical condition does not apply to ‘Grandfathered’ individual plans. As defined in health reform legislation, ‘Grandfathered’ plans are those in effect before March 23, 2010 which also meet other specific requirements. Even if your current health insurance plan is not ‘Grandfathered,’ you may still have to wait until the plan’s next annual renewal period before adding your son. It’s also worth noting that retiree health insurance plans are not required to allow you to enroll a child as a dependent. Contact your health insurance company to learn about how they are implementing the new regulations. In some cases, you may actually have to apply for and purchase a new individual or family health insurance plan in order to take advantage of these new provisions and get coverage for a child with a pre-existing medical condition. Work with a licensed agent like eHealthInsurance.com to find a plan best suited to your needs and budget. Question: I have employer-sponsored group health insurance and want to add my child, who has a pre-existing medical condition. When can I do that? Answer: Contact your Human Resources department or benefits administrator to learn about your next open enrollment period. Employer-sponsored health insurance plans that extend benefits to dependents generally provide coverage for pre-existing medical conditions, but check your policy to be sure. Unless your child is a newborn or just adopted, you typically have to wait until the annual enrollment period before adding a new dependent. Question: Can I add my 23-year-old daughter onto my employer-sponsored group health insurance plan now? Answer: You may enroll your daughter onto your employer-based group health insurance plan whether or not she has a pre-existing medical condition. However, you may have to wait until the plan’s next annual renewal date after September 23, 2010 to re-enroll her. Contact your Human Resources department or benefits administrator to learn more. Two caveats: If your daughter is already eligible for coverage under her own employer-sponsored group health insurance plan, your plan is not required to accept her; and if you’re currently covered under a retiree health insurance plan, your insurer may not be required to allow the addition of new dependents. Question: What if my 20-year-old son aged off the family health insurance policy which I purchased by myself? Answer: You are eligible to add your son back onto your coverage if you are still enrolled in the same plan. Contact your health insurance company or licensed agent to learn more. Keep in mind, however, that until 2014 when the final provisions of health reform are enacted, adult children age 19 and over may still be declined coverage based on a pre-existing medical condition. If your adult child is declined coverage under your health plan due to a pre-existing medical condition, there may be government-sponsored options available. Talk with a licensed agent to explore alternative carriers or contact the non-profit Foundation for Health Coverage Education (www.coverageforall.org) to learn more about government resources in your state. Question: I don’t want my 20-year-old son to go uninsured, but I’m not sure I can afford to add him to my coverage. Are there any other options? Alternately, if your son is in college there may be a school-sponsored health insurance plan available to him. However, if you have employer-sponsored group health insurance and your son has a pre-existing medical condition, your plan may be his best option. Question: My daughter lives out of state. Does it make any sense to add her back to my health insurance plan? Answer: Not necessarily. Some health insurance companies don’t cover services rendered outside their coverage areas, or they may restrict benefits for services rendered by non-network health care providers. Before re-enrolling your daughter in your health insurance plan, contact your health insurance company or licensed agent to make sure you understand how her coverage will work. It may make more sense for her to apply for individual health insurance in the state where she currently lives. Question: My son got married and he and his wife don’t have health insurance. Can I add them to my health insurance plan? Answer: The new health reform law will allow you to cover an adult, non-dependent child on your health insurance plan even if he or she is married. However, you will not be able to cover your son’s spouse or his children. If you have employer-based group health insurance that includes coverage for dependents, he is eligible to enroll even if he has a pre-existing medical condition. If you have an individually-purchased family plan instead, your son could still be declined due to a pre-existing medical condition. 1 This data is based on an internal evaluation of a portion of 288,238 individual major medical health insurance policies purchased through eHealthInsurance that were active in February 2010, where the primary policyholders were between the ages of 18-24. Individual health insurance plans purchased were those available through the eHealthInsurance website. Accordingly, the data does not include any plans that may have been available through sources other than the eHealthInsurance website and only reflects a portion of the individual plans available throughout the country. The update analyzes annual deductibles and monthly premiums paid on individual major medical health insurance policies purchased through eHealthInsurance and active in February 2009 and February 2010. Data for Rhode Island and Vermont were not included for this report. 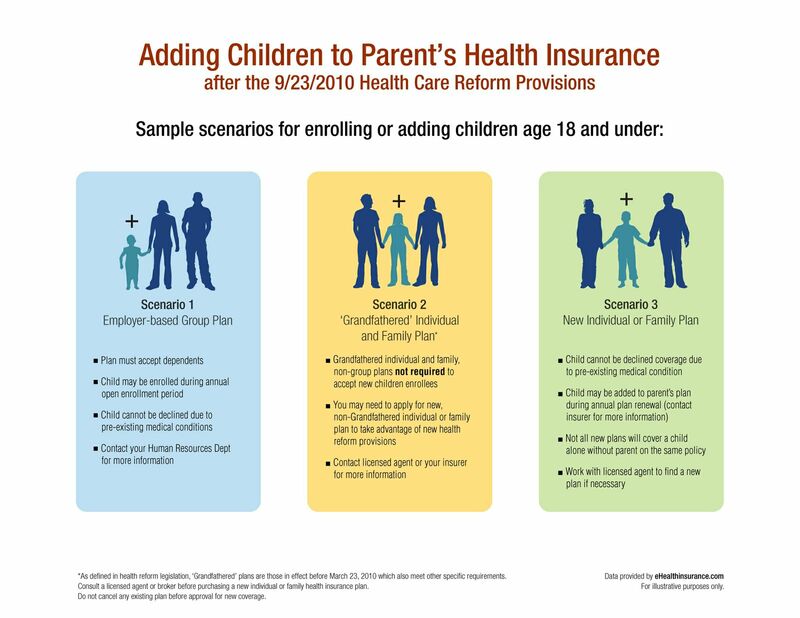 Chart describing the options for parents adding dependent children to their health insurance coverage, after the September 23, 2010 health reform provisions. 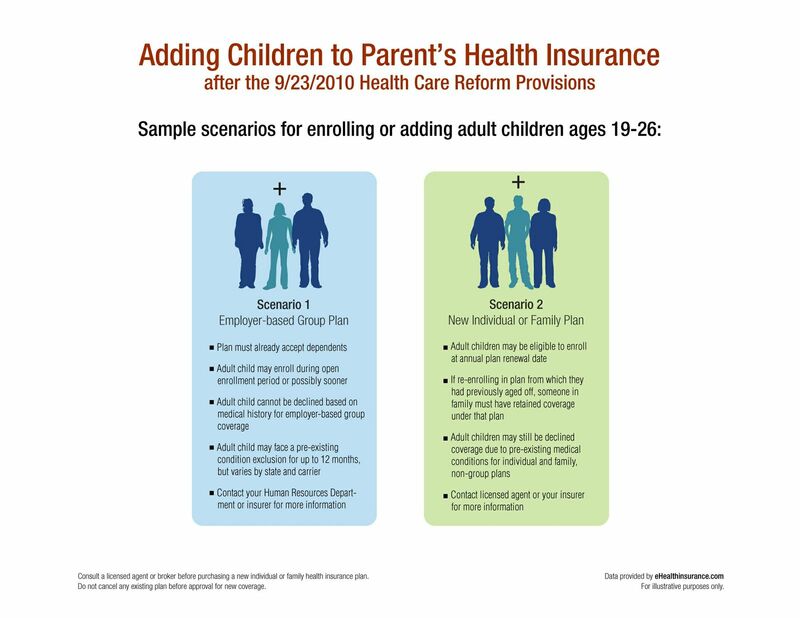 Chart describing the options for parents adding adult children (ages 19-26) to their health insurance coverage, after the September 23, 2010 health reform provisions.